I usually don't post on Saturday, but this is a special extra for Halloween. A few weeks ago, my husband and I picked up some fresh manju (cake filled with sweetened bean or other traditional fillings) at a shop near the local train station. They were cute, and we both like manju. The orange one is kaboucha or Japanese pumpkin and the brown one is sweet potato. These sorts of sweets are made exclusively by one shop and cannot be bought just anywhere. They are, essentially, like the product of a bakery. That is why this is a special post rather than a real review. Not only can my readers not buy these unless they happen to visit the same shop as us (or the same chain), but the chance that this exact same treat will be around at this time next year is pretty low. 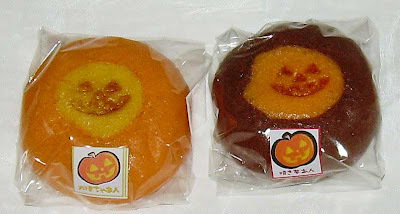 Mainly, this is just a one-off for some pictures of the type of cute seasonal fare you can get in Japan. The pumpkin one has a bean/pumpkin mixture. I thought it tasted strongly and pleasantly of Japanese pumpkin (like a butternut squash), but my husband couldn't taste the pumpkin element at all. He said it was pleasant and nicely sweet, but couldn't really pick out the pumpkin. I ended up eating half of his as well as all of mine (the sweet potato one). The sweet potato one has a chocolate exterior and sweet potato mix interior. You can see little bits of mashed sweet potato in it. The outside coating was surprisingly intense in cocoa flavor and overwhelmed the sweet potato flavor at first, but it was revealed a bit more fully after the first bite. Both of these were fresh, moist, and really tasty. 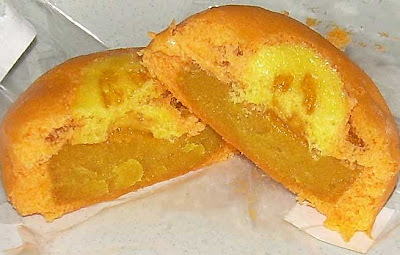 I think the cake exterior, which is very moist and a bit gummy (which sounds bad, but isn't), is made from yam flour. If you visit Japan, this is exactly the sort of thing you want to try from local shops and eat while it's absolutely fresh. You really can't beat this sort of experience, and it's the type of thing that isn't nearly as good the next day. Happy Halloween to all of my kind readers! There are two "Family Mart" convenience stores within walking distance of my home. One is about 5 minutes away and the other about 9. I usually go to the closer one, but was in the mood for a walk and visited the other and discovered that all conbini of the same chain are not treated alike. 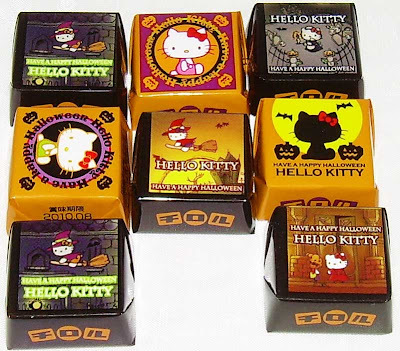 One of them had a display of special "Hello Kitty" Halloween tins with Tirol chocolates and the other did not. I'm guessing this has to do with the fact that the one that is furthest away is a lot closer to a subway station on a major line. 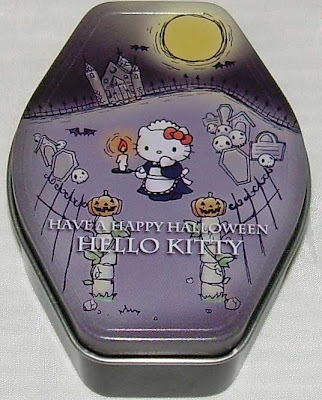 The tins are 315 yen each ($3.46) and you get to choose 8 Halloween-themed small Tirol candies to put in it (not the premium ones which are larger and cost 32 yen (35 cents) each. 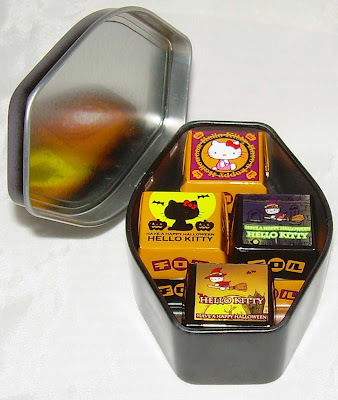 The value of 8 of these small candies is 80 yen (88 cents), so you're really just paying for access to a small, extremely cute tin featuring Hello Kitty. The display box, incidentally, gives you instructions for exactly how to place the candies in the tins. There are two styles of tins. One is a square-shaped house which doesn't seem nearly as Halloween-like (but has Halloween designs) and the other is the coffin. There were 3 designs for each style of tin and they were repeated on the packages of the chocolates (most of which are pictured above). There are only two kinds of Tirol candies to choose from and I have reviewed both of them before. One is "Bis", a bland little cracker-like biscuit covered in chocolate, and the other is a chocolate-covered roasted almond. Both of these are included in my previous review of a variety pack. Of course, one doesn't buy these for the candy. In my case, I didn't even buy this for the tin for myself. I bought the tin to send to someone back home as a gift. While I'm not immune to the extreme cutenesss of some Hello Kitty stuff, I'm not really enamored of her. 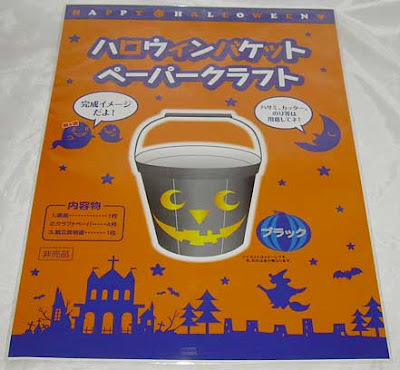 Family Mart is doing a full-scale Halloween campaign (detailed on their site in Japanese) and you are given a free papercraft Halloween bucket when you buy one of the items that is a part of the campaign. Image pilfered from Family Mart's site. There are three colors and styles of buckets. The one I got is black. I'm not going to open it and put it together, but I did pinch a picture off of Family Mart's site which shows what they're supposed to look like. Sometimes I fear that I'm reviewing far too many of the same types of foods. That is, I buy things which are featured in flavors that I favor rather than branching out too much into new territory. In particular, I live in a country which is a seafood and fish lovers paradise and I tend to shy away from snacks featuring these flavors. Buying this product has shown me why I should keep my focus narrow on things which are in the mainstream of what I enjoy rather than try and branch out. The truth is that I bought this sembei by mistake at Family Mart convenience store while hurriedly shopping. I had been in the same store the previous week and had noted that there was an umeboshi (pickled plum) variety of sembei on display and figured I'd pick it up some other time if the mood struck me. I saw the colors on the bag and the price and size (105 yen/$1.17 and 32 grams/1.1 oz.) and just grabbed it quickly and checked out. It wasn't until I got home that I realized that I'd mistakenly bought marinated pollock roe (mentai) mayonnaise sembei rather the pickled plum. My previous experience with mentai-flavored snacks came with the Yaokin variety pack, and I didn't like the mentai stick in it then. This sembei had the potential to be slightly more appealing because it's higher quality and is a mix of both fish and mayo flavors, but I didn't have high hopes. The crackers smell fishy and like mayo. The first taste is mainly of the mayo and a little heat. After that, you're hit with the fish flavor and that's where it leaves me flat. The crackers are beautifully seasoned with three levels of flavor and they are fresh and crispy. Despite how well-made they are, I can't rate them high because I just don't like fishy flavors. I will slowly finish the bag because 2/3 of the experience is pretty appealing to me, but I can't say I'd buy them again. If you like spicy fish flavors and mayonnaise, I can't recommend strongly enough that you try these. Clearly, buying something which is not within my range of preferrred flavors isn't a very good idea. The fact that these I can't possibly find fault with these aside from the fishiness shows that I can't give a reasonably objective rating when something involves a flavoring I don't care for. product URL on the company site: here. Back in college, I majored in psychology. In order to qualify for a degree, we all had to take a course in research and part of that was training rats. Contrary to popular belief, it's uncommon to train them in mazes. The usual way to train them is to put them in something called a "Skinner Box". The box is like a little cage but it has a bar in it which releases a food pellet when the rat happens to press it. At first, the rat may accidentally hit the bar as it scurries around the confined space trying to get out. When it gets a pellet, it may then scurry around some more looking for others and accidentally hit the bar again. Eventually, it'll figure out that pressing the bar gets a food pellet. As I was considering these bite-size KitKats, I was thinking that these are like food pellets for humans. They don't really offer much over a regular KitKat bar, which is hardly unwieldy and difficult to manage. These do take away the "cumbersome" task of biting portions off of the bar, but I think the main point of offering this type of KitKat is to market them differently. Either that or they're priming us for psychological experiments with a gigantic Skinner box and this is a plan to introduce the form our food will take so that we'll be accustomed to it when the time comes. My husband picked up these salty caramel bite-size KitKats at New Days for about 100 yen (about a dollar). There are 13 little pieces in the bag weighting in at 35 grams (1.2 oz.). 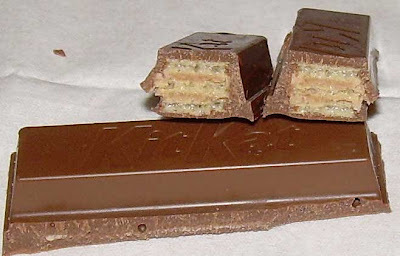 You do get more chocolate per bite in this format, but I'm more of a fan of the wafers in the KitKats so that wasn't a plus for me. Also, there are 186 calories in the entire bag and I think this form encourages you to eat more than a regular KitKat which comes with two packs of two fingers. You're likely to eat half of a bar and all of this bag. 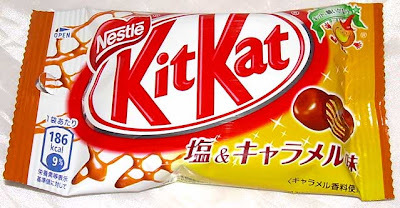 The KitKat bites smell like fake caramel, but so did the caramel purin KitKat minis (which incidentally are back on the shelves at this time because of Halloween), and those were better than expected. When you first take a bite, you get the strongest taste of salt. After that first bite, it tends to fade a bit but is still there as a pleasant addition. The caramel is a little on the strong and artificial side, but not overwhelmingly so. The chocolate is plain old Japanese milk chocolate (slightly bittersweet) and I think having more of it works well here because it stops the caramel cream from being a stronger flavor component. I didn't expect to like these, but I ended up finding them pretty pleasant. I will say though that they may be less appealing if you're very sensitive to artificial flavoring or not fond of salty sweets. If neither of those is the case for you, I'd recommend trying these. There are some questions that you never ponder until you start a snack blog and the issue presents itself. One of those questions is, what is the difference between caramel and butterscotch? It turns out that caramel is heated to a higher temperature (burnt sugar) and butterscotch to a lesser temperature. I also read that caramel uses white sugar and butterscotch uses brown. This issue arose because these cookies don't actually smell like caramel, but rather they smell like butterscotch. I'm pretty sure the Japanese do not differentiate between these two flavors. That wouldn't be surprising since they have little (or no) indigenous baking culture and such subtleties probably escape the average person. I came from a culture with a lot of baking and it escaped me up until now. My husband and I bought this up while shopping around a local market. They were on sale for about 150 yen ($1.52) and there are 10 cookies in the bag. Of course, they are individually wrapped. Each cookie is 4 cm. in diameter and 49 calories. The ingredients are vague because they include "caramel chips" rather than define what makes up the chips themselves. 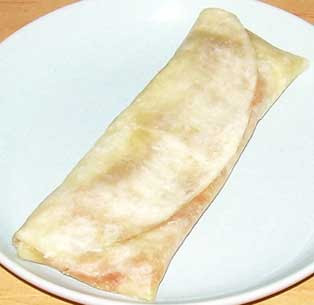 These are also made with shortening and margarine rather than butter, so they're likely made with damaged fats. The cookies have a lovely texture. 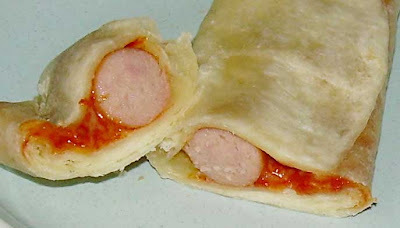 The exterior is slightly crispy and the interior soft and slight chewy. 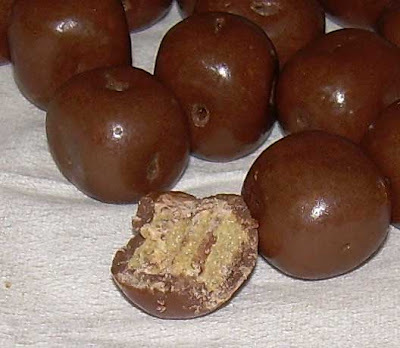 They're lightly sweet and the "caramel" flavor is not overwhelming or fake. I really enjoyed these, but I'm not a huge fan of butterscotch (or caramel). I couldn't see buying them again of my own volition, but I definitely would eat them again if they were around and my husband wanted to buy them for himself. 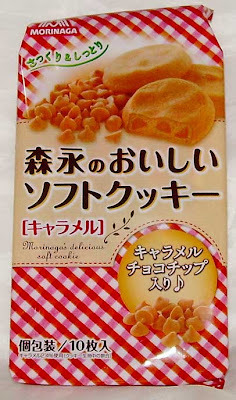 As a fan of both caramel and butterscotch, he really enjoyed these, so based on that, I gave this a "happy sumo" rating. One thing Japan is renowned for is the freshness of its food and the fussiness of its populace when it comes to buying the freshest food. The Japanese, on the whole, are willing to pay more for higher quality food. The main problem with paying more for something which is fresh is that you lose value if you sit on that food for a long time. Such was the case with this marshmallow which I'm sure was as good quality as the first one of these that I reviewed when I bought it, but had gone a bit stale after about a month in the refrigerator. Given how favorably inclined toward the anko Fuwa Fuwa marshmallow cake, I was looking forward to sampling another variety, despite my delay in getting to it. My husband found these at New Days convenience store for about 50 yen (50 cents). To be fair, I should preface this review by saying that I'm not a huge lemon fan, though I like it well enough. I tend to favor lemon in cakes and cookies though rather than candy. 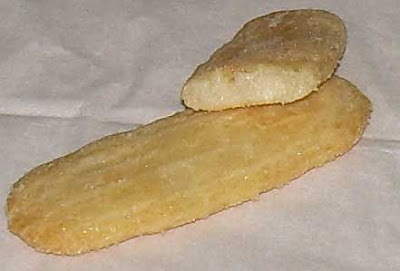 In candy, lemon often reminds me of cough drops unless the the flavor is greatly diluted. The fact that this marshmallow is filled with a type of lemon sauce was slightly surprising. The package does say "cream", not sauce. 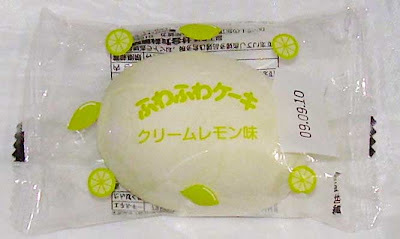 The marshmallow itself is lightly lemon-flavored, but the filling in the center is really intense. The sweetness level is quite appropriate, but the lemon is strong. We had two of these and my husband was keener on it than I, though I have to say that he had a cold and the flavor may have been muted for him. I thought this was good for what it was, but the lemon was too much for me. It really did remind me of medicine and I think I even imagined a honey flavor attached to it (like a lemon honey cough drop). If you enjoy really strong lemon sweets and hard candies in particular, this might really float your boat. Otherwise, it'll probably be too much for you, too. Image taken from Burger King's web site. Updated: October 24 with YouTube video of people eating it added. Some things are so bizarre that you think they have to be a Photoshop mash-up or part of the Onion. When I learned about this, I thought it simply had to be a joke. Why would Burger King push Windows 7? Why would Microsoft want to ally itself with a fast food place to promote software? Well, it turns out that it is no joke. From October 22 to 28, Burger King is selling a monster burger with 7 patties (each about 4 oz./113 grams) on an "American size" (13 cm/5 in.) bun. The catch is that they are only selling 30 of these burgers each day at the price of 777 yen ($8.50), but this is no surprise. They couldn't possibly make any money off of these if they sold an unlimited quantity of them at that price. After the first 30 people, the price is the usual price one would pay for having extra patties added to the burger (1450 yen/$15.88). 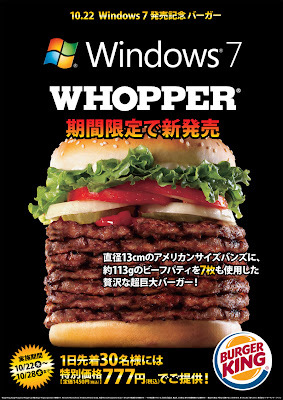 The burger comes in a paper wrapper with a Windows logo on the top and is about 10 cm/4 in. in height and 11 cm/4.3 in. in diameter. Word is that it has over 2000 calories. One person who sampled it said that it felt like eating a small animal in terms of the feel of the quantity of meat. It was also impossible for the writer (a Japanese person) to open his mouth wide enough to wrap it around the burger. Obviously, I won't be tracking down one of these as I don't even like hamburgers, let alone ones that are likely to lock my jaw if I try and eat one. If this sort of food were offered in the U.S., everyone would be crashing down on both Microsoft and Burger King and talking about how this sort of excess contributes to the obesity epidemic. At the very least, it'd show up on This is why you're fat (I spoke too soon, it's already there!). In Japan, it's just something people chortle at, shake their heads at and about which they say, "those kooky Japanese". A little update: The Shinjuku iLand Tower Burger King said they ran out of these (that is, sold the first 30 at 770 yen) by 9:00 am when they open at 7:00 am. They also said that some people then paid the full price (1450 yen) for them thereafter. I guess that once they got the idea in the idea in their heads that they wanted it, they just had to have it. Lately, I've been rather lucky about finding mini KitKats for individual sale at convenience stores. That means I don't have to gamble on a huge bag of them while not knowing whether I like them or not. 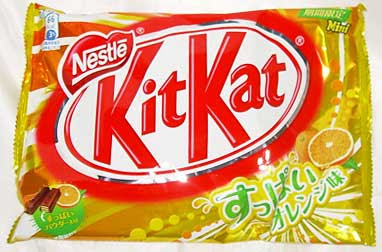 For some reason, these "suppai orange" KitKats never made it to the individual bins. If I had to guess, I'd think it has something to do with the fact that a lot of those individual bars don't seem to be selling very well. I still see ramune KitKat minis for sale in AM/PM and they were a summer release. While it's not unusual for older seasonal releases to show up at the discount snack store long after the season passes, it's unusual to see them in a convenience store. 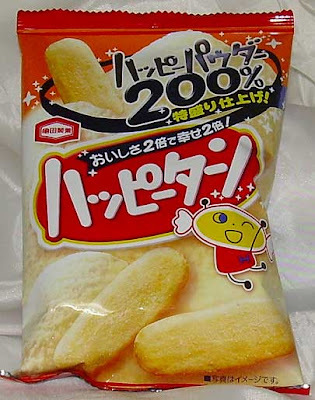 I did buy these in the discount snack shop, but mainly because they were on sale for 198 yen ($2.20). 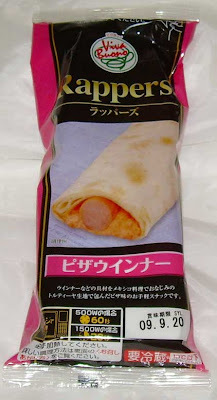 For the record, these types of bags usually sell for about 258 yen ($2.88). I didn't pay close attention, but I believe that there were 14 12.3 gram (.43 oz.) bars in the bag. "Suppai orange", incidentally is "sour orange", so this is another in a long line of chocolate orange combinations that I've sampled in Japan. When you first open the package, it smells like a nice orange chocolate flavor. The bars are a bit soft, even at reasonable room temperatures and have the KitKat wafer texture that one would expect. 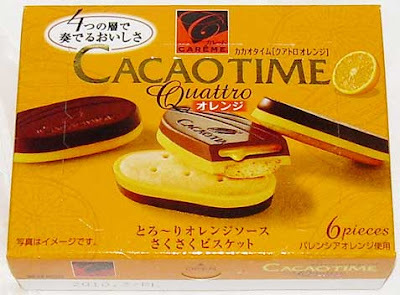 The flavor is a very nice combination of chocolate and intense orange flavor. It's not so much "sour orange" as just strong orange, juicy orange flavor. Frankly, the flavor of this really reminded me of a chocolate and orange Tootsie Roll mixed together, though the texture was pure KitKat. I really liked these and I think anyone who is a fan of orange and chocolate together may enjoy these. The only concern would be that the orange might be too intense for some. This would be a bigger issue if the orange tasted fake, but I think it has good verisimilitude with real orange flavor. Of all of the strange drinks I've tried, this one presented me with the greatest mystery. Like the Ginger Ale Lemon KitKat, this product represents a flavor that you can't imagine being incorporated into this particular type of product. I rarely sniff something and think "smells like barf". 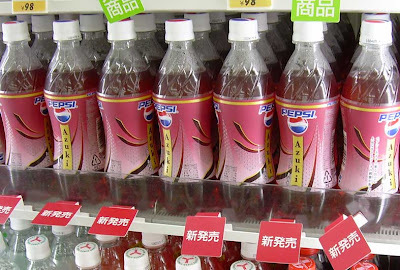 Pepsi Azuki smells like someone threw up their bean cake. This was not a promising start. It does smell like azuki that has gone off a bit though, so I guess that is something. This was the weirdest color of Pepsi that I've ever seen. My guess is that it was tinted this color to resemble red beans. In the right light, it's a deep pink. In somewhat darker light, it's a ruddy red. The bottle is 207 calories for 490 ml. and I picked it up at Family Mart for 147 yen ($1.62). The taste isn't nearly as bad as the smell lead me to believe it might be. It mainly tastes like jasmine with a red bean chaser. There's nothing in it which says "Pepsi" to me though. The jasmine flavor is slightly flowery, but dry so that it doesn't seem too perfumey. The azuki bean part hits you at the end and the jasmine at the beginning. This works a bit better than the opposite might. I wouldn't even ponder buying this again. It's not intolerable or anything, but it's pretty weird. The jasmine part is pleasant enough and makes me wish they'd make a jasmine Pepsi (if they're reading, I may be giving them ideas). If this was sugar-free, I'd finish the bottle, but I'm not spending 207 snack calories for the novelty of drinking the whole thing. 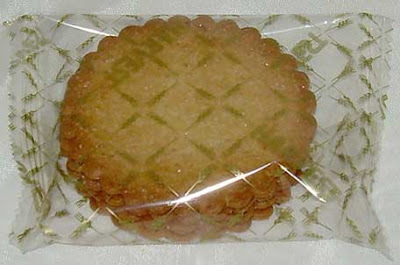 Harvest "biscuits" (from Tohato) have been around for about 30 years and I think I've eaten them once or twice during my 20 years in Japan. It's not that there is necessarily anything wrong with them so much as they're just not all that impressive. Like many other less than exciting food stuffs in Japan, they seem like they should be healthy because they aren't covered in frosting or chocolate and don't have a fatty filling, but they're really fairly caloric for what they are. 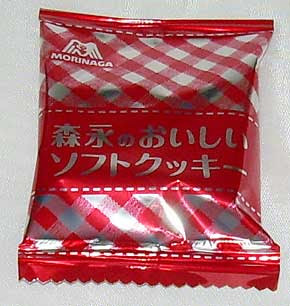 A packet of 5 crackers, each about 6 cm. (2.4 in.) in diameter is about 60 calories. The main appeal for me of the plain ("butter") Harvest biscuits is that they have a noticeable coconut flavor and aren't too sweet. That being said, they also aren't all that flavorful. I'm not sure what the intended market is supposed to be, but I'm guessing these are supposed to be a light treat to have with tea. They may actually be good for dipping in your tea, but I didn't test that theory out. I picked up these because I was in a sweet potato treats frenzy. There seemed to be new goodies everywhere and these got roped in in my enthusiasm. Unfortunately, I'd forgotten how boring these are. 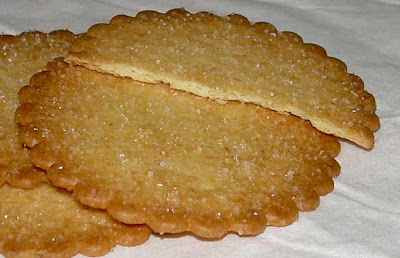 They're called "biscuits", as if they were a type of cookie, but they're really just sweet crackers with a sprinkling of sugar on top. They smell very much like the plain version of Harvest Biscuits. That is to say they smell like coconut with just a hint of sweet potato. The sweet potato flavor is a little more prominent than the scent conveys, but coconut still dominates. 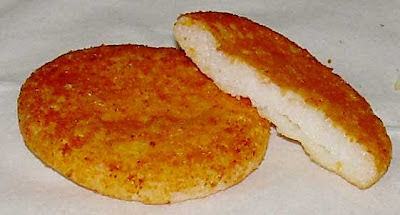 I love coconut, but I don't buy a sweet potato biscuit for that reason. These are nice enough, and I will definitely finish the bag through time. However, they just aren't anything special. If you love lightly-sweetened crackers with a bit of coconut and sweet potato, these may even light your fire, but don't kid yourself about them being not as bad for you because they're so unassuming in composition. I just found them too boring and I wouldn't buy them again. Note: If you'd like a desktop picture featuring the cracker with a smile on the cover of the packet, it can be downloaded at the bottom of the page here. I must admit that I didn't see this flavor coming. Of all of the things that Nestle Japan might have come up with, I didn't think ginger ale would be on the list. It's just not a very "Japanese" flavor, nor is it the sort of thing I expect chocolate to be flavored with. 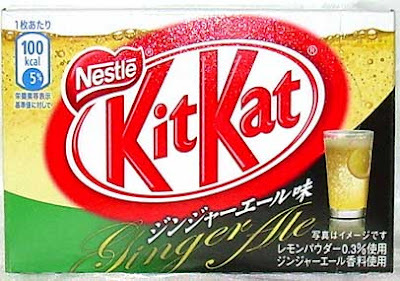 Maybe ginger ale is the next big fad flavor in Japan and this Japanese KitKat is meant to get the ball rolling. My husband recently noticed that a diet version of the venerable Canada Dry brand has been added to the shelves in many stores after years of it being only around in a version with sugar. My husband found this for 120 yen ($1.32) at New Days convenience store, though I expect it'll show up at other "conbini" as well. That being said, I went to three other convenience stores (Lawson's, Family Mart, and Mini Stop) and none of them were carrying this. My guess is New Days gets a lot of things first because it's unlikely that a KitKat would be available in such a limited fashion. The interesting thing about this bar is that it does smell like both lemon and ginger ale. It tastes like quite sweet stale or flat ginger ale with a lemon slice in it. Actually, it's more like ginger ale with some juice squeezed in it then the rest of the lemon tossed in. The lemon element is pretty strong, but it doesn't overwhelm the ginger ale flavor. This is an amazing triumph in terms of making something taste like something you'd think it couldn't taste like. Who would believe that a candy bar could taste so much like ginger ale? That being said, authenticity in taste doesn't necessarily translate into a great candy bar. This is interesting, for sure, but it's not really "good". I'm glad my husband was around to share it with me because I'm not sure I'd want to spend 100 calories on eating even half of it myself. That being said, I don't think I'd want to throw it out. It's not that bad, but I also don't want to eat the rest of it. I'm thinking of sending it to a friend to try, but I just don't know who would make the best guinea pig. This was also reviewed on Pocky Watch and Jen's KitKat blog. If there were ever proof that gum is a boring product and almost all of the limited angles associated with marketing it have been played out, it is this gum. When I bought it, my motive was to get something other than throat lozenges to help combat my dry throat on days when I did a lot of teaching. When I looked inside, there was a whole other dimension to this product. The gum actually comes with instructions for how to remove it from the box. I don't think I've ever needed to be told how to chew gum before. 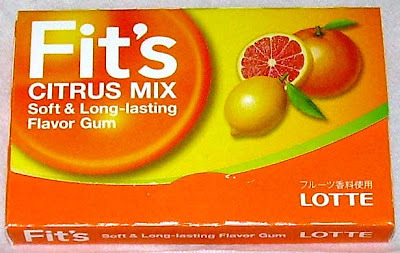 I'm guessing Lotte, which produces this gum, must feel that its consumers are especially dumb. They even give you illustrations. 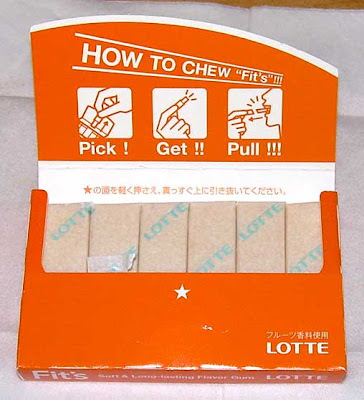 The whole point of this gum chewing instruction sheet is to let you know that the complex process of removing the wrapper from the gum and placing it in your mouth has been made more convenient and simplified for you by the good folks at Lotte. When you grab a piece of gum from the box, the bottom half tears along a perforation and stays stuck in the box so you can raise the exposed gum to your mouth and shove it in. I'm surprised they don't include pictures of how to move your jaw so you can understand how to actually chew. I'm even more surprised that they don't have an illustration of a throat with a "no" illustration (circle with a line through it) to make sure you don't swallow it. The gum itself is billed as having long-lasting flavor and it actually does retain diminished flavor for up to about a half hour. The intense flavor that comes at first lasts a far shorter time. It's not a very pleasant citrus blend though. The main element is grapefruit and lemon and it strongly tastes of artificial sweetener. Maltitol and Erythritol are the first two ingredients, after all. This keeps the entire box of 12 small pieces (the same size as Dentyne) down to 32 calories, but it's just not very good. I won't be buying this gum again. Well, I might buy it again if I ever suffer severe brain damage and forget how to unwrap gum and put it in my mouth. If you'd like to download some desktop pictures of this gum's promotional pictures (an iPod style dancing silhouette), you can get them here. When I was a kid, we only received three television channel's signals - ABC, CBS, and NBC. We were located in the boonies and our old wire antenna was too far away from the Pittsburgh transmitting station to get the PBS channel or the really cool channel that showed re-runs of Star Trek (TOS) and the best repeats of old shows. Occasionally, we'd get a grainy PBS show, but that was usually just Mr. Rogers. Due to my television deprivation, I didn't grow up with Sesame Street. Being deprived of that seminal show means that I wasn't exposed to the Cookie Monster. While I haven't done a psychological study on the emotional impact of being deprived of the Cookie Monster during ones formative years, I speculate that my general lack of enthusiasm for cookies relative to other types of sweets is a result of not being able to get PBS on the tube when I was growing up. My husband certainly is a lot crazier for cookies than me, and he grew up in Silicon Valley with all sorts of television viewing options. Despite this lack of indoctrination into the way of the cookie, I was intrigued when I saw this box of orange chocolate cookies at the local 99 yen shop. The main thing that dissuaded me upon first viewing is that each cookie is 57 calories and they're quite small at 5 cm (2 in.) x 3 cm (1.2 in.). This makes them more candy than cookie. That doesn't have to be a bad thing, of course. 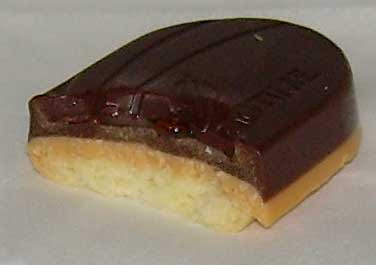 Thee are three layers to the cookie - a bland, crunchy little butter-cookie type biscuit, orange-flavored chocolate, and bittersweet chocolate. There's also an orange "sauce" in the middle of the chocolate layer. You can smell both the orange and chocolate when you give it a sniff. The bittersweet chocolate and orange flavors are intense and blend very well together. The cookie portion is mainly there for texture and is a fairly hard. 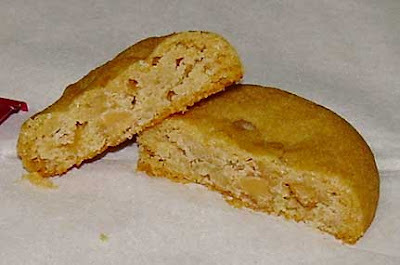 One of the big points about these cookies is that they are made with Valencia oranges, and the flavor does taste real. I really liked this and would definitely go for them again. That being said, the strong flavors might be off-putting to some, especially if you favor milk chocolate. 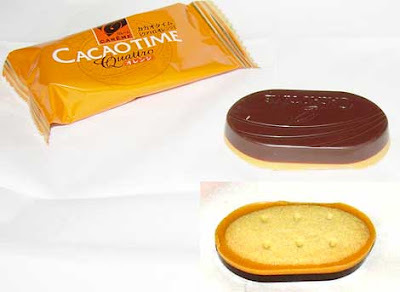 I love strong flavors when they are in good quality ingredients, and both the chocolate and orange appear to be so. 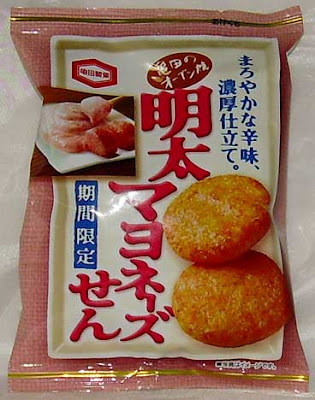 Kabaya, which makes the Careme brand, offers these in other flavors and shapes as well. 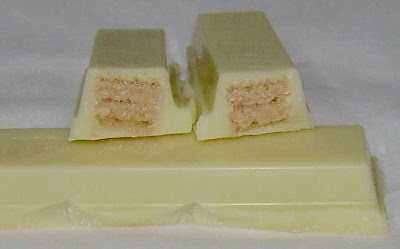 The other two types listed on the web site are caramel and chocolate and bitter chocolate and white chocolate. Oddly, the orange chocolate version is not listed on their web site. If you'd like to download a wallpaper of their mascot, you can find a few choices here. If you could buy a product which says it now contains 200% more "happy powder", you'd buy it, wouldn't you? Of course, my idea of what might constitute "happy powder" and what Kameida Seika believes it is are almost certainly different. In fact, I'm guessing talk of "happy powder" in the U.S. might end up getting you arrested by the undercover vice detectives. The brand for this, Happy Turn, comes with another crudely-drawn, simple mascot. It's one of the few food items that Kameida Seika releases that has a character attached to it. If you look at the large number of their products that I have reviewed, you'll see that the rest of them are pretty sedate in their packaging. The design is hard to understand at first, but Happy Turn's head is actually one of the rice crackers wrapped in plastic (like a hard candy with the edges crimped off on either side). While there are several package styles and presentations for these listed on the web site for the product, this 200% happy powder version isn't listed so I can't know for certain if it is appreciably different aside from having more powder. I found this at Seiyu supermarket for about 100 yen (about a dollar). The bag weighs 50 grams and has 253 calories worth of crackers. One of the advertised attributes of these crackers is the fact that they have little crags and crannies in them to hold on to more spice. 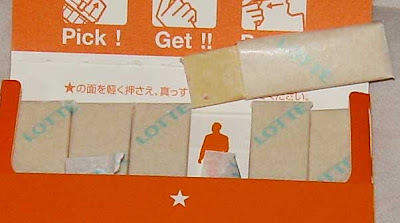 When you open the bag, you smell a strong, distinctive smell which is common with sembei in Japan. It's a mixture of that baked rice cracker scent and whatever spices are commonly used. I thought these may actually be fishy crackers, but they are not. Their ingredients list is pretty vague, but my tongue detects a lot of seasoned vinegar flavor as well as a touch of sweetness. This makes them immensely savory and compels one to just pucker up a bit from the sourness. The crackers themselves are fresh, extra crispy and really quite perfect for a puffy ("soft") style sembei. I really enjoyed these. I liked the strong vinegary flavor and love the texture and crunch of the crackers. I ate half the bag in one sitting and had to resist the urge to eat even more. The flavor may be a bit intense for some people, but it was to my tastes. If you're not a fan of really strong flavors, you might want to forgo the 200% happy powder and go for the regular version of this sembei. I do recommend that you give it a try in one variation or the other. Note that there was a desktop pattern for this product, but I couldn't get the link to work from my Mac. I'm not sure if the site is set up incorrectly or if it uses code that my Mac doesn't recognize. Either way, I'm afraid those who want a sembei-headed mascot wallpaper are going to be left high and dry.